Friday….Mar.29, 2013….hey everyone happy Easter to you and safety and blessings to you if you are traveling. Looks like we will at least get a nice Saturday out of the weekend. Just a quick note, have an unexpected opening for Monday Apr 1 if interested, had an Ecatawba cancellation. If you are interested you can enjoy a full day fishing premium private water for $295, and yes that price covers two people….. Quite a bargain as that trip is normally $225 per person of $450. We would catch huge fish….a lot of them…! Lets go fishing! Sat. Mar. 23, 2013….Good Saturday morning to you, an early start this morning. Headed out to guide Scott and Diane Roe and their three sons today. Looks like we will get in todays trip just before more weather moves in. We should do quite well, fishing lately has been superb. Nymph fishinh has been great and with great water levels we should see more and more dry fly opportunities. 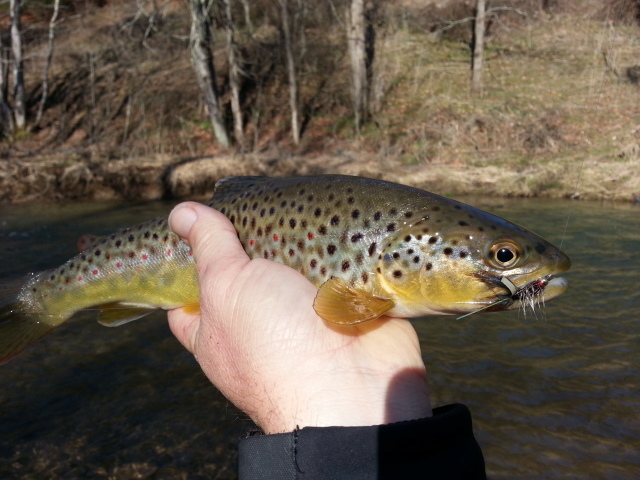 Lately blue wings, Quill Gordons, and a few gray caddis are all popping . Should be good in the weeks to come. Thurs. Mar. 21, 2013….a Weeks end update, great week of fishing so far even if we have had rain, snow, cold , wind…wondering what’s next. Weather has been all over the place. Fortunately, fishing has not. Its been great….not good. Great. Going to be a phenomenal spring. One friend remarked to me “its about time to get back out fishing…” What? Get back out?……we’ve been out man. All winter long…in all kinds of weather and conditions. And a great winter fishing season complete with over 100 inches of snow up high…flooding rains, and one 100 yr flood event covering a ton of the mountains. And we caught fish everytime out through it all and some days were truly inredible. Thanks to the Lord. We had a great day yesterday with over 60 fish and several beasts including one 20″ beast by Mike Lanning, a 21″ beast by Ed McGee and Brian Fitzgerald, and one 27.5 inch beast by Mike James, a ton of 15-19 inch fish. We got a mid-morning start after having some high water with a tinge of color to it, the flow was about 485cfs and eventually dropped to 414….and that means fish are eating…. We got a later start due to pretty cold overnight temps which will sometimes make the fishing a little slow early on but better as the sun comes up….particularly since it had been two days of 60sF. It was just as I had anticipated, as I reflected back on our being the first folks to fish/guide Escatawba in 2000 when it opened. We started on the upper end where there are a number of very deep spots that hold a lot of fish and where the fish tend to stack up. We got a few hook ups early then steadily things picked up as the day went on….the cold and wind also picked up as we had chilly temps and winds to 35mph….brrrrrr. Winter just does not seem ready to give up just yet even though its officially spring. Oh well. We had a good afternoon with everyone netting some fish… It was great. 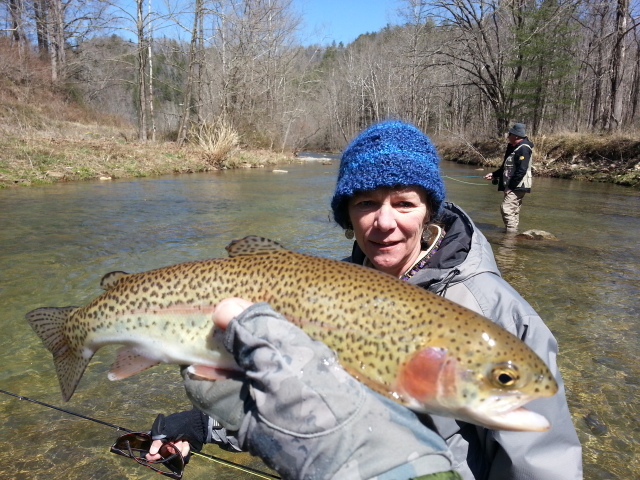 Visit our website fishing reports page here to view our photos…it was good. In today playing catch up after a bunch of days on the water. Winter returned last night, some of the coldest air of the season….8 degrees Beech Mtn, 10/11 Sugar Mountain…middle to high teens over much of the rest of the area. One to three inches of snow fell last night between 8pm and midnight leading to some traveler’s advisories…I know today would be tough to be out in all day fishing with cold and high winds but man its been good. Really Good. Awesome. Looks like a snow event of significance for Sunday and Monday and into Tuesday…we’ll see. There’s a spring wedge of cold air dammed up against the Appalachians ….we will see if there’s enough cold air to promote a lot of freezing precipitation. Will be taking care of some fly orders today as well as restocking our web store….in which sales have been great lately. Starting to get some interest all over, had several days of 1000+ hits . Spring is here…! Even if it doesn’t feel like it just yet… More snow on tap for Sat night through Tues….the drama never ends! Have a group trip on Saturday, looks like we’ll get it in without any problems and then more snow arrives…. 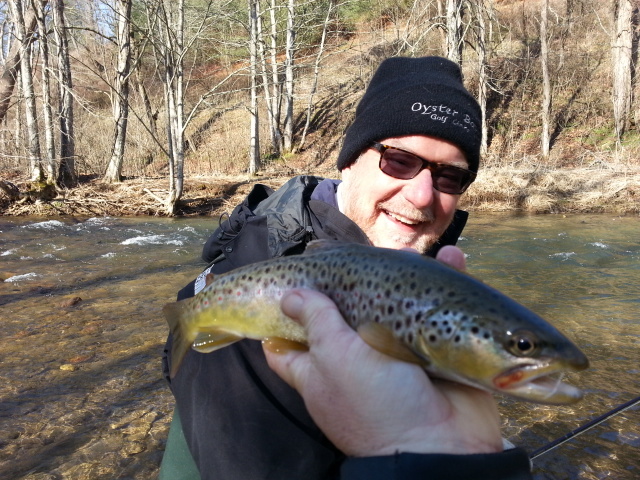 Great Day, Cold But Great Fishing…. Wed. Mar. 20, 2013….Had a great time today did a group trip at Escatawba Farms …we had a great day with over 60 fish and several beasts including one 27.5 inch beast by Mike James. Have some incredible photos to post, man was it good but was it ever cold and windy. Headed back…..
Good Fishing in High Water. ..
Tues. Mar. 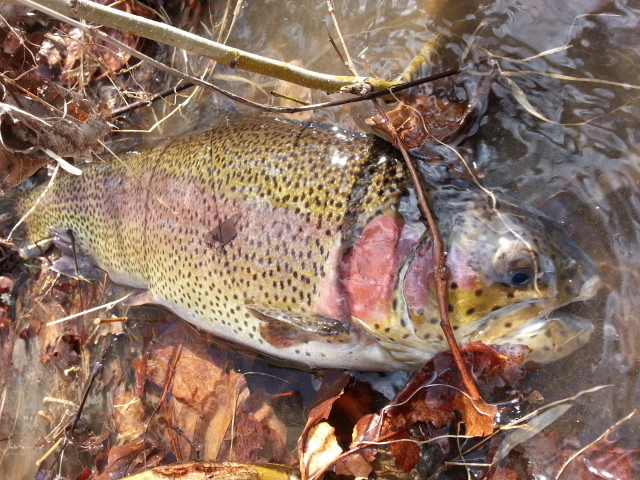 19, 2013…..Had to search for clear water for us to fish today but we did get into some good fishing. Guided Jenell Hudson and Mike Mitchell and we had a blast. The water was up, it was cold and extremely windy all day. 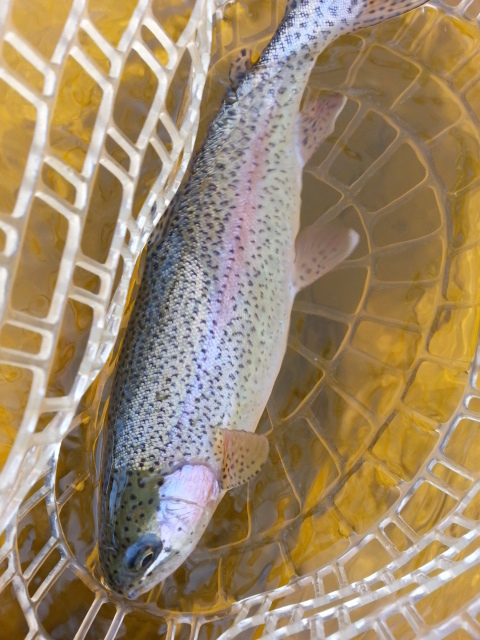 We nymph fished a number of different and small nymph patterns and we did well, netting between 40 and 50 fish…a mix of rainbows and brookies. We fished three long stretches of river and saw a good many flies hatching. When we get a string of warm days the hatches will come. I saw blue winged olives, caddis, Quill Gordons, just to name a few. That warm weather will have to wait though as there is a 5 day cold spell on top of us. Maybe more snow. I will be guiding a few guys at Escatawba Farms tomorrow and am expecting a good day. Sat. Mar. 16, 2013…..Wow, what a difference a few days makes. Warm, then rain, then snow, then lots of runoff, then repeat. That is what the weather has been like lately. 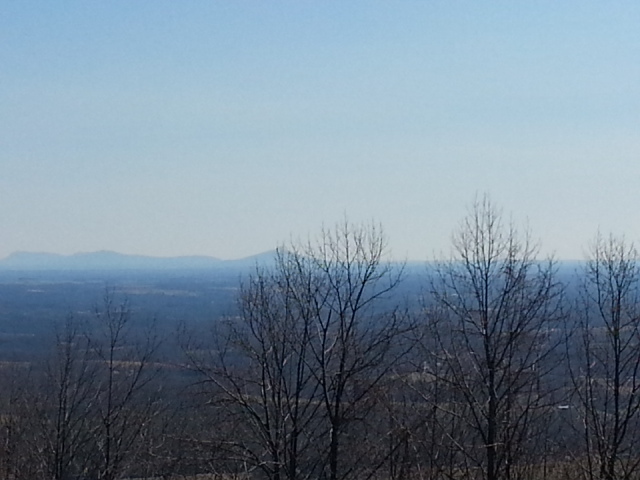 And today its forecast to be 70F or more and approaching 60F in the mountains..quite a change. This should get some bugs moving and some hatches going. Water temps are approaching the mid 40s F again after a string of nights in the teens in the high country. 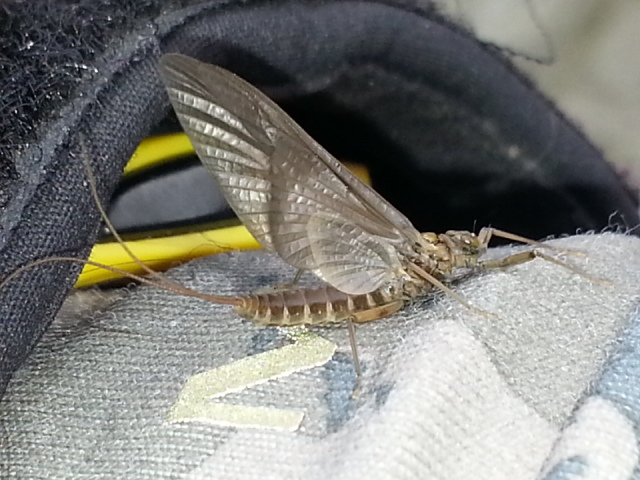 The first of our early season mayflies have been hatching the past week and a half in waters below 2000ft, and on a majority of our Delayed Harvest waters too…..places like Roaring R watershed, upper Yadkin/Buffalo Fork Wilderness, Catawba R/Morganton Watershed, Wilson Creek/Johns R watershed….South Mtns…. seeing the first early season #18 Baetis /blue Winged olives, #18 Blue Quills, and the fly pictured which is a #14 Quill Gordon (epeorus pleuralis). Great time to have some size 12-18 Adams Parachutes in the box…if you want to put one fly in your box to cover them all and be done with it…. A great way to imitiate Quill Gordons (Quill Gordon natural above, upper Yadkin basin) is with a general dark fly like this parachute below. Many folks get hung up on the idea that “its got to look just like the natural” thinking…which isn’t true at all. 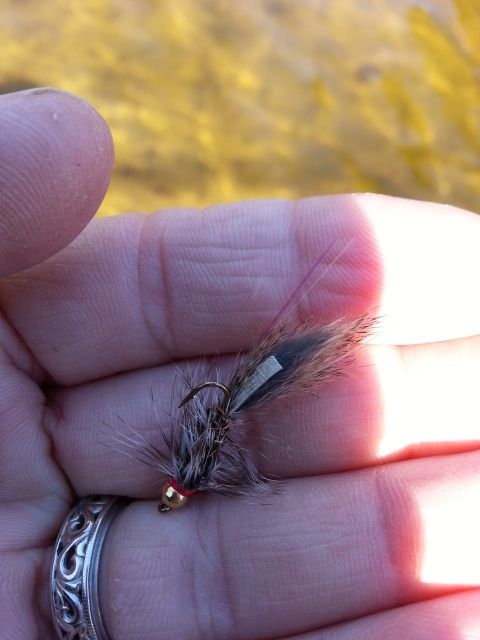 A size 14 overall darkish fly will work. 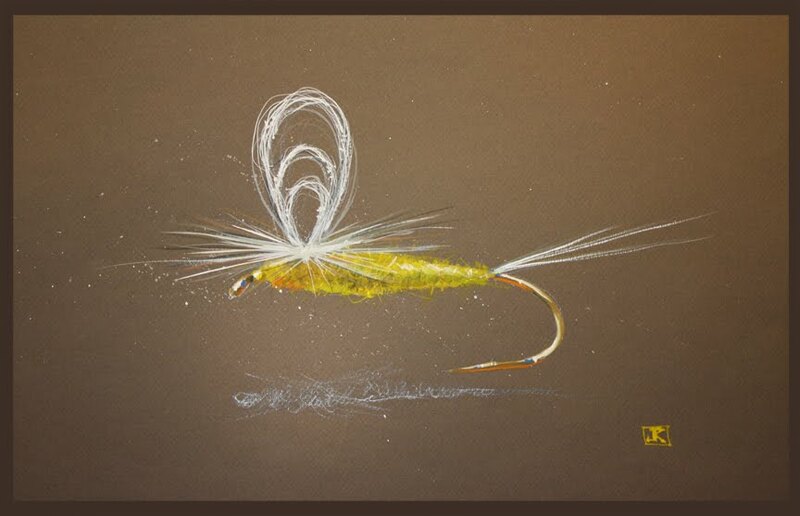 Click here to view one of my favorite custom Quill Gordon dry fly patterns and here to view a step by step tying recipe. Another great and busy week coming up. Monday will be working on filling the fly boxes back up. I tie most everything I guide with and fish with so I stay busy this time of year filling in holes as far as what has been working. Will be tying up a pile of dead squirrel strymphs as we’ve been killing them on this fly. Also, I will be knocking out several large fly orders , several from upstate NY and PA where I have sold a pile of the Squirrels to folks fishing streamers and steelheading. 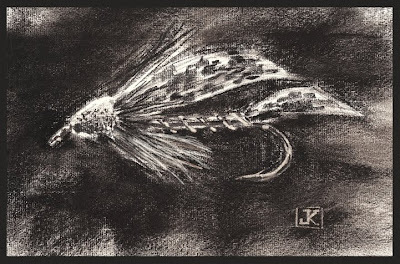 Another hot one is our rendition of one of the hottest late winter /early spring flies for Appalachia called the ‘Y2K’… I have several customers in the Northeast that buy these 50 to 100 of them at a time. That gives you some idea as to how well they work. We caught fish on them all week…..and yesterday…and if there’s a big fish (rainbows especially) around you’ll find out if you are fishing one of these flies. We have a busy week full of guided trips coming up too, a Tuesday trip guiding Mike and Jenell Hudson of Raleigh, NC, an 8 person trip to the private water on Dunlap Creek, Escatawba , Va, then Fred Lekse who is part of the Kevin Harvick NASCAR race team on Thursday, and a 5 angler group trip with Hayden Roe on Saturday. Should have some great fishing reports and it looks like the weather will be uneventful at least through next Friday….looks like Saturday could hold a possible snow /sleet event for our enjoyment….great. Just great. We have one slot left for our Escatawba Farms March 20 trip, its an incredible $185 rate per person…..a continuation of our Winter Special as we signed up so many folks for the first two of them we couldn’t accomodate them all. So here’s your chance to get in on the fishing special here and catch some ginormous fish….like quite a few of them! Purchase your slot here if you’d like to join us and call me or email me if you have any questions or if I can give you more info on the trip. (Hunter Early below with a gigantic Dunlap Creek bow I guided him to….there will be more than a few shots at fish like this on our 3/20 trip). Have a great weekend and a good upcoming week….and enjoy the ACC Tourney as it wraps up…. 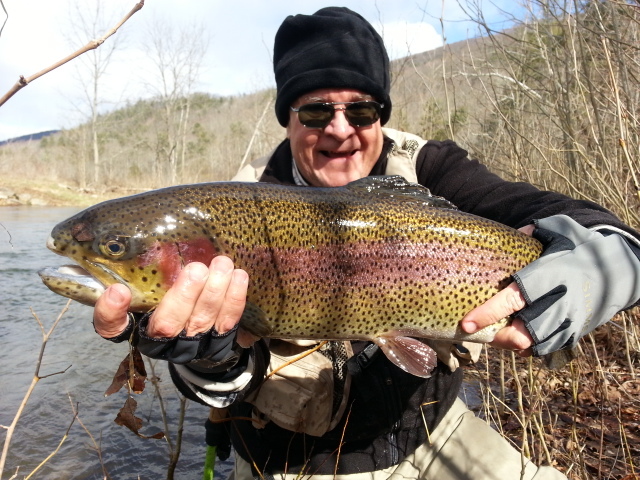 Yes , even the old man caught a fish this past week…. my son Josh and his friend Austin were kind enough to let me take a crack at a large rainbow we could see holding in a deep ledge run…. I told them..”move over boys, let the old man show you how its done. ” Little did I know two drifts later the fish would eat my Dead Squirrel Strymph fly …. It was cool to talk smack to the “young” bucks and then have it all work out…lol. Challenging Day, Wow How Windy…. Sat. Mar. 16, 2013….The weather folks had said something about windy and boy were they ever correct. Met Dr Charles Surles and his son Michael for a guided trip…we met bright and early and were on our way. It was cold and windy to start and we began our day fishing nymphs. First stretch we fished Charles landed 3 fish and lost a 17" fish that came unhooked a few feet from net. We hit another stretch and fish some deep banks and man was the water ever up. High and cold it was, 34.5F but the sun came out and it warmed things up. We hit another stretch and got into about a dozen fish, all of them stripping streamers, and some of them nice brookies. 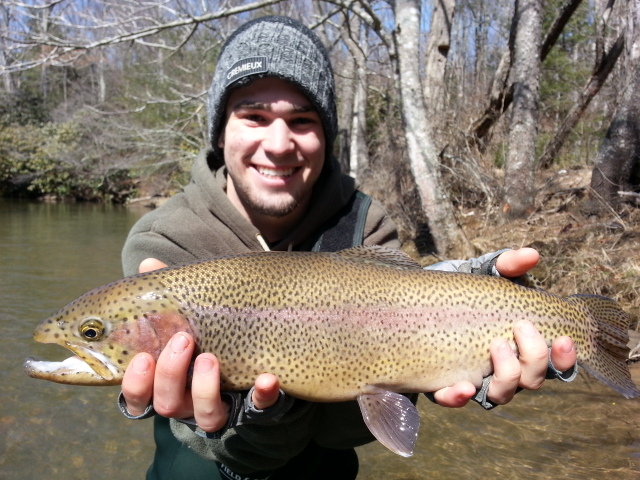 Michael had one 22" rainbow in the mix too…as well as a few browns too. 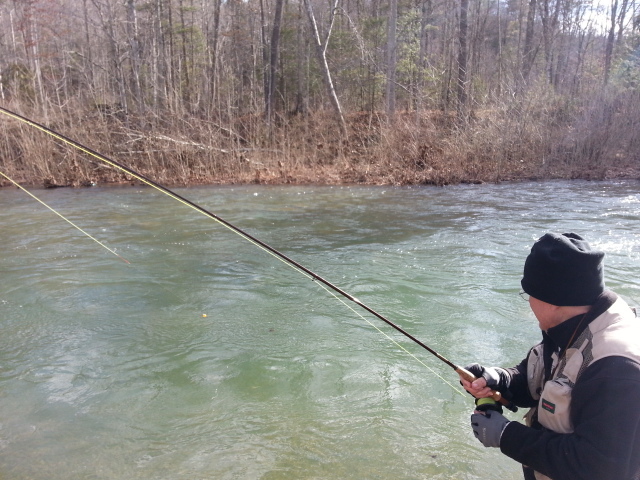 We took a lunch break and then after lunch we fished two more long sections and did well. Lost 3 20 inch citation rainbows to breakoffs….and landed probably another dozen to fifteen fish all together. 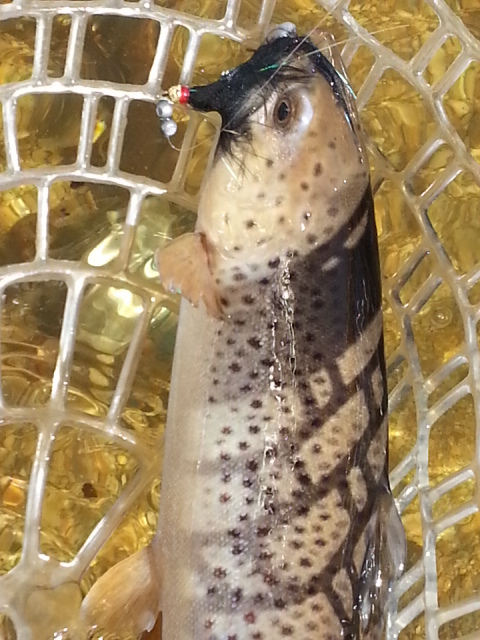 We finished up catching a few on streamers….just killed them on one of my rabbit strip streamer patterns. It was a challenging day with the heavy rigs, high water, and 30-40mph winds but we did manage 3 dozen fish….a good day anytime. Thanks to Charles and Michael for another great day. Tying some flies to fill boxes back up and will be gearing up for Saturday’s trip guiding Mac Cheek, Greensboro, NC. 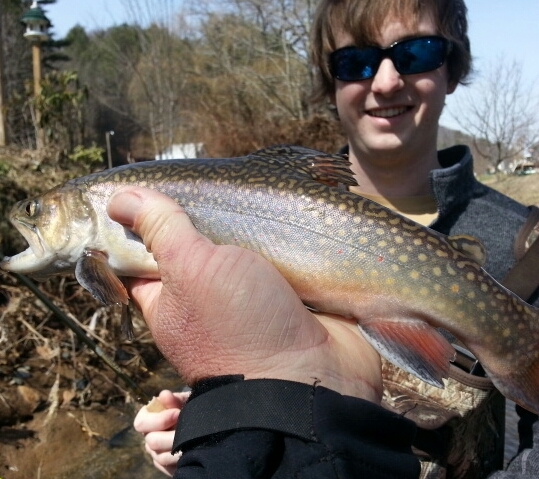 Fri. Mar.15, 2013…..Great day fishing yesterday guiding my youngest son Josh and his friend Austin Hart who was here visiting over spring break… Austin is from Colton, CA, and it was his first time fly fishing and he did well netting 25 fish. Josh made me proud netting over 20 of his own including one 25 in beast of a rainbow. We had good fishing even though it was in the uoper 20s most of the time, breezy , and the water was 34.5F . Caught all our fish on nymphs fished with a ton of weight. More to come…..have a great weekend. ..! Looked all over for fishable water, Shaun and I traveled an hour more to get to it….the water was high and blown out just about everywhere as the mtns got 1-2 inches of rain overnight Monday night and Tuesday morning. Heavy. heavy downpours…..there were a number of waters we drove by that normally are the last to even get dirty or rise a whole lot and get dirty and a few of those were orange/muddy. Quite a rain event…and switching to snow late Wed. as another upper level ‘disturbance’ as the weather folks say moves through. 1 to 3 more inches snow up high. Shaun and I fished dirty and high water the first half or several hours of the day and about 12pm the water began to fall and clear a little. We struggled early, caught a few here and there, then things improved. Fished one stretch and scored quite a few, including one 20-25″ rainbow Shaun played masterfully for about 30-35 seconds before the fish made one last burst and broke off. Bummer. We caught a mix of probably 30-40 fish, rainbows, brookies, and a few browns. Ended the day yanking some streamers, something I love to do and will do when the water gets above 40F as the fish usually will be in more of a run and chase mood then. Also, once the water started to drop and clear there were a few rising fish if you can believe it, sporadic but they were there. And tons of size 18 blue winged olives hatching….which is, by the way, normal. 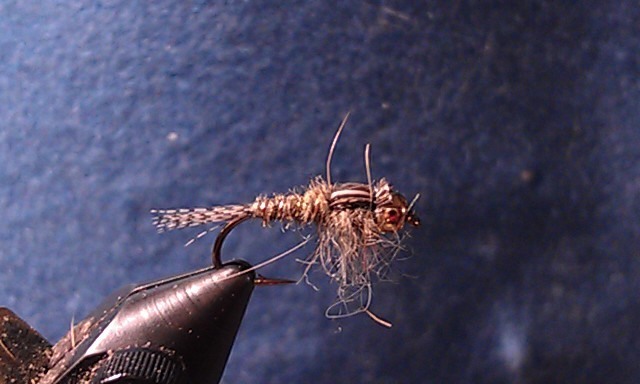 Better have some size 18 nymph and dry imitations in your box, or lose an opportunity. 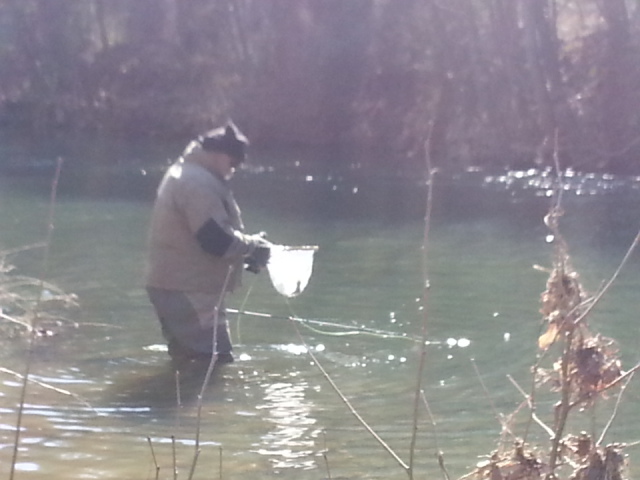 Water temps were in the 46-48 range and that will bring the bugs out. Spring is definitely coming. 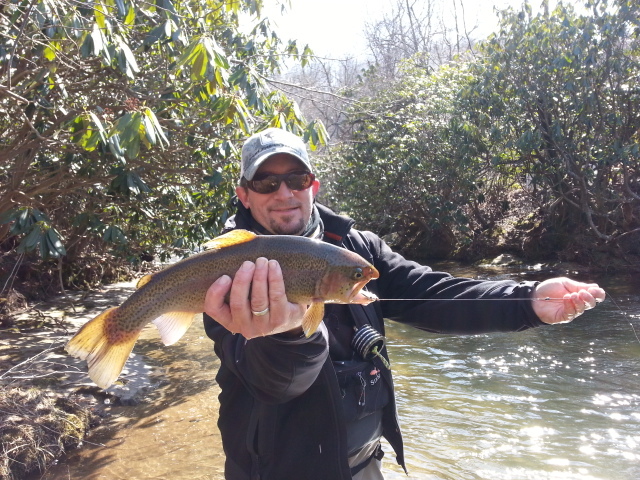 Great Day of Weather….Phenomenal Fishing…. Sun. Mar. 10, 2013…..Got in kind of late and was late posting a report….but it was gooo…..a good day…well, actually a great day I guided Kelly, Alex , and Harrison Harrill and we had a 40-50 fish day , the water is in good shape and I expect we will see some topwater action soon particularly with all this warmer weather. 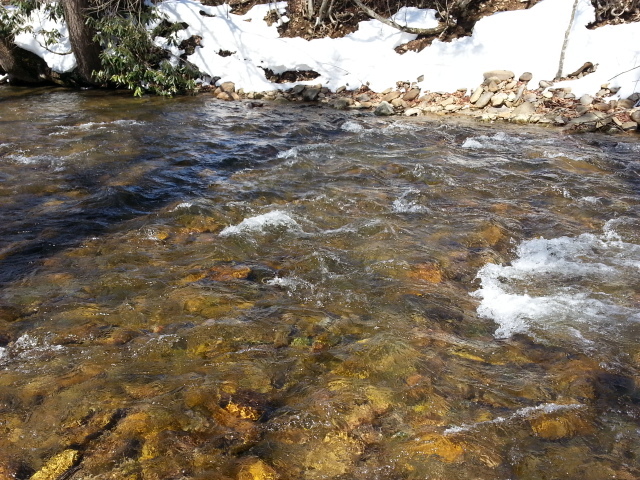 Lots of snow melting but its keeping stream levels just about perfect. 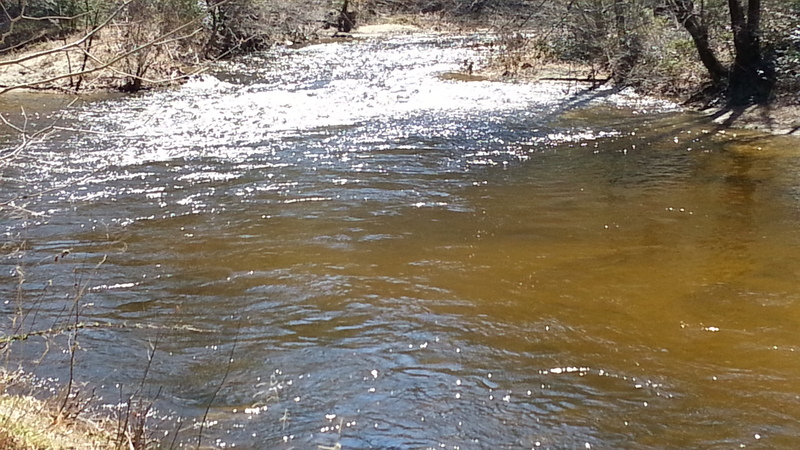 Amazing how one stream is high though and another low, even some that are only a few miles away from each other. It was Alex’ and Harrison’s first fly fishing trip and they scored 15 and 16 each…respectively….pretty impressive I would say. We did a lesson, then hit the water….I’d say they took to it pretty well. 15 or 16 fish your first time out is a feat…..that’s a good day no matter how long you have been fishing. We fished two waters, caught a good mix of browns (lots of browns), rainbows, and brook char, and caught all of them nymphing. 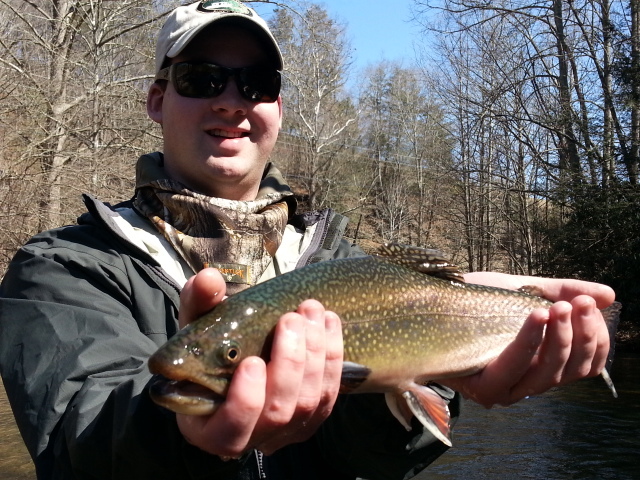 We caught several citation fish…..and had two of the largest brook trout I have seen in a long time come off right at the net….. Harrison caught several citation fish, the largest one this brook trout below. 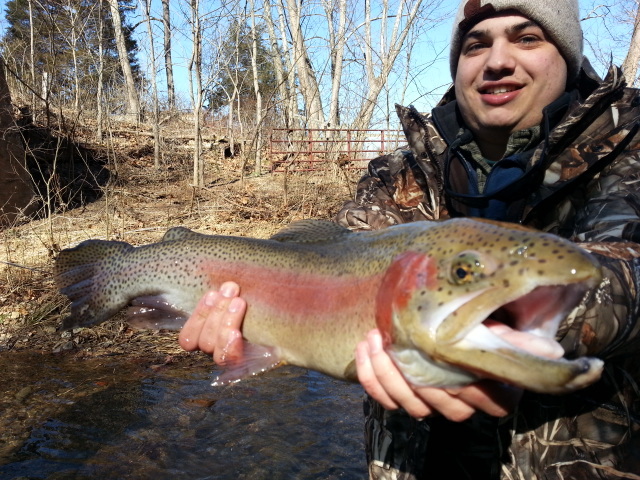 He also had on a rainbow that was near 25″ long that came off after a long, spirited fight…. Busy week coming up, will be out tomorrow on the water guiding longtime customer David Carter and his son Patrick. I am expecting a good day, fishing has been nothing short of incredible. Have trips also this week with Shaun Redgate, Forest, VA, and Len Worsham on Wednesday….and Thursday will be taking my sons fishing. Have some rare March openings this week, a Friday and Saturday…..the rest of the month is filling up as well. If you are tired of winter and wanted a quick shot of red hot fishing….now is your time. 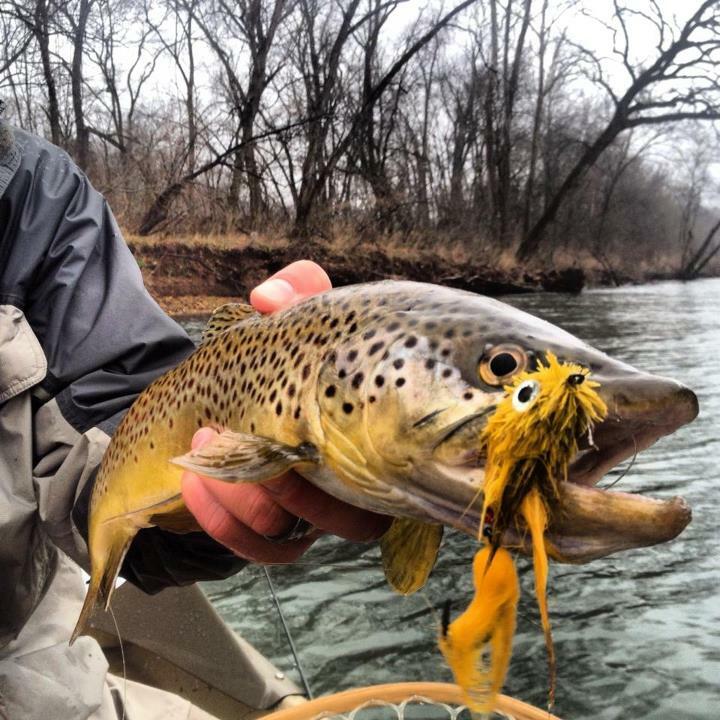 A phone call or an email and you and I can be slaying some fish….its that good right now. And it looks like its going to be like that this spring! I can’t wait…. going to be a lot of large fish caught too as the conditions are perfect for it. Have a great evening and a good Monday and start to your week….! 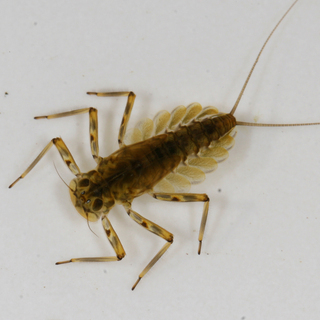 Will have current report on river conditions and the fishing when we are on the water in the morning…. The past week with rising water temps the fish have been munching some of my new dead squirrel fly patterns like crazy….they’ve caught almost all of the large/larger fish.